Beer and brandy are not the only alcoholic drinks you can serve to add cheer to Chinese New Year feasts and visits. Bourbon and bak kwa, for instance, are a great combination, says Proof & Company Spirits' "spirits evangelist" Jeremy Chua, 27. Although scotch may be more commonly drunk, he says, the High West Campfire Whiskey (a blend of scotch, bourbon and rye) is a good introduction to bourbon and rye. "Sweet, spicy, and smoky notes from the whiskey pair well with the sweetness of bak kwa," he says. For the get-togethers to welcome the start of the Year of the Rooster, here are some ideas on how to pair spirits with popular dishes such as pen cai, yusheng and roast meats, as well as steamboat and steamed fish. The recommendations are by Mr Chua; Mr Zachary de Git, 27, EC Proof spirits adviser and head bartender at Crackerjack in Tanjong Pagar Road; and Mr Ch'ng Poh Tiong, 61, wine consultant to NTUC FairPrice and Finest supermarkets and Yan restaurant at the National Gallery Singapore. 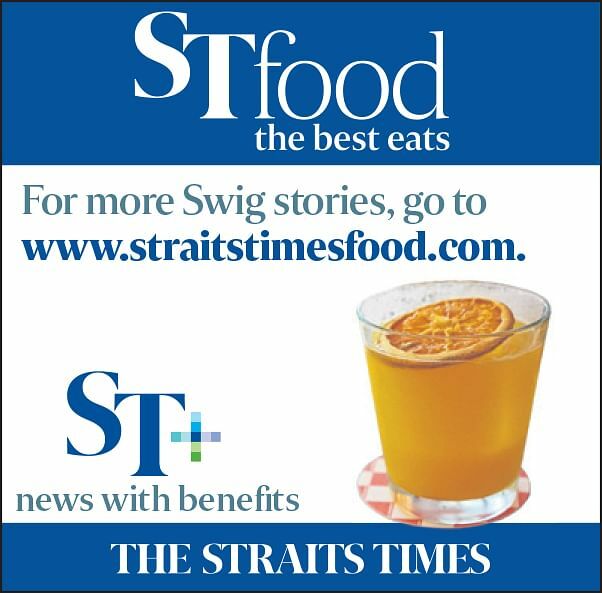 •Swig is a weekly page dedicated to all drinks distilled, brewed, fermented and aged. "Pen cai is a braised treasure pot of goodness, with layers of seafood and meat. "With rich flavours that coat the tongue, a clean and bright Citadelle gin and tonic with fresh citrus will cut through the flavours, giving each bite a new experience." "Depending on what ingredients you put in the dish, a white or red wine may be more suitable. "So, if it is predominantly seafood, a white wine. If meat or mushroom dominates, then a red. However, a red tends to become metallic or taste fishy with seafood, particularly shellfish. "Since it's the New Year, why not go for a bubbly such as Champagne Perrier Jouet Grand Brut or an Italian sparkling wine such as Bisol Desiderio Jeio, Prosecco di Valdobbiadene." "A valley-style tequila is usually earthy, smooth and slightly briny, and goes well with fish. "Purasangre Tequila would be the perfect combination with yusheng. It not only cuts through the rich, sweet and sour flavours from the condiments, but also adds flavour and pairs really well with the raw fish." "Given the sweetness of the sauce, something fruity, off-dry or semi- sweet is recommended. But it must also be refreshing, as yusheng is the first course and you don't want to dull or satiate people's palates right at the start. "An outstanding pairing is Prunotto Moscato d'Asti from Piedmont in the north of Italy. The white wine is grapey and also has a dash of natural carbon dioxide retained from the fermentation." "Any Mezcal will work great with this snack, but try something earthy such as Derrumbes Michoacan Mezcal. "The slightly savoury notes from the Mezcal work well with the sweet and savoury pork deliciousness." "A sweeter bourbon would go well with this, so try Michter's US*1 Small Batch Bourbon. "The cereal notes work well with roasted meats and have the backbone to stand up to the rich flavour of roast pork belly." "Pork, chicken and duck are versatile with anything from a light to a full-bodied red. "Depending on your inclination, anything from the light, elegantly fruity Hugel & Fils Pinot Noir Jubilee 1998 from Alsace to a medium- bodied and balanced Chateau HautBeausejour from the commune of Saint-Estephe in Bordeaux, to the full-bodied Grant Burge Filsell Shiraz 2013 from South Australia's Barossa Valley would work." "A medium- to full-bodied oaked white wine to take on all that Omega 3 in the oily fish, such as Shaw + Smith M3 Vineyard Chardonnay 2014." "Steamboat, albeit delicious, can be a hot and sticky situation. Something refreshing like a classic gin and tonic, such as Sipsmith London Dry with East Imperial Burma Tonic, will keep you going throughout the meal. "The tonic will also help in digestion, allowing you to go for rounds two, three and four." •Spirits recommended by Mr Zachary de Git and Mr Jeremy Chua can be purchased online at http://ecproof.com or The Proof Flat, 43A HongKong Street (open: Mondays to Saturdays, 11am to 7pm). Wines are available at most wine merchants. Count your festive snack calories.